Collecting antique furniture in different types and shapes is usually a hobby to many people. But the problem lies in finding the perfect way to display them and highlight their aesthetic value. Palaces and large villas are great for displaying antique furniture and highly valuable items. Homeowners should apply efficient space planning in order to identify the right corners and spaces of the house to display valuable collections such as antique furniture and enjoy their artistic value, whether in the lawn, kitchen, or small bedrooms. So, here are some ideas on what type of antique furniture pieces to display in different areas of the house. 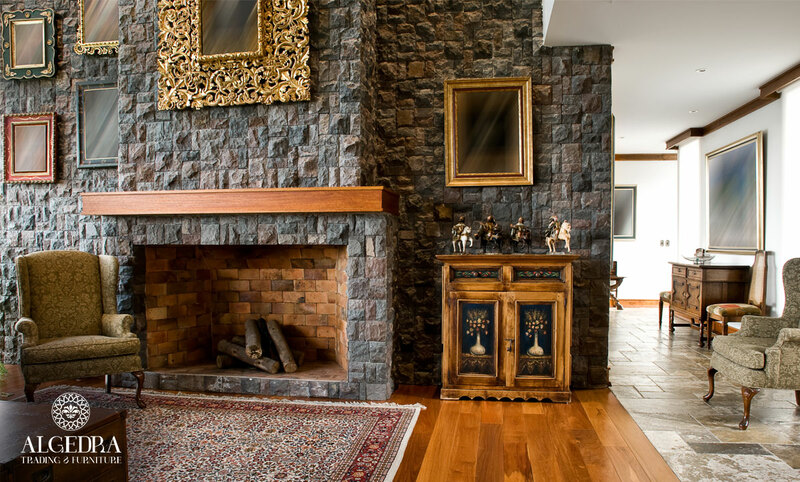 Is the best place to display stone statues and water fountains that chime well with the natural green rug, so its artistic and wonderful sculptural value are clear to the eye. Add highlights to the front door by having large oriental lantern and marble/stone basins filled with colorful flowers. Or have to two Grecian columns or winged lions to add a warm welcome to visitors. Foyers can accommodate many small or large pieces like statues, vases and tables in different shapes and sizes. To have a minimalistic yet classy look, one can add an old table in the midst of the foyer with a small candle holder on top or a vase with flowers in it. One can also put a carved table on the side either metallic or wooden between two seats and a large mirror behind the table. The foyer can also be left empty to display two old columns or large vases however they need a large space to elaborate the design and color decorations. 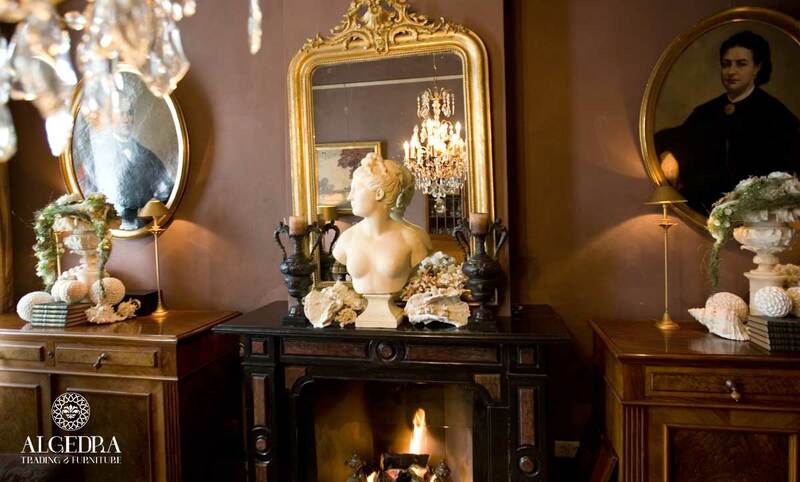 The Reception hall mostly has antiques and important antiquarians that are cherished by the house owner. One can display their old guns, original Arabian swords, oriental lanterns, collection of Old Persian carpets or unique plaques that have stories behind them. For small and highly valuable items such as old coins, daggers studded with pearls, or precious stones can be stored inside glass cabinets as well as those ancient dishes, distinctive sculptures, perfume bottles and archaeological pieces. The living room is where family and friends gather together and chat. The best furnishings in this area should be something that facilitate communication and comfort. One can place their artistic plaques or recognitions, old lanterns, table lamps, artistic chandeliers or an old fireplace. You cannot fill it with much antiques unless the user of it wants more than simple pieces, it is possible in this case to add an old rustic dresser or a large or small rustic box or a Moroccan patterned table lamps or antique collections with personal value to the owner. 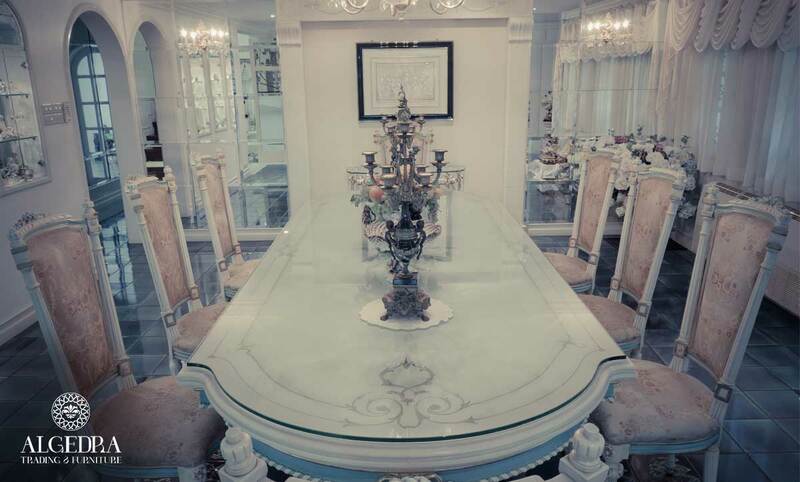 To have an elegant and classy dining hall, many chose to display archaeological antiques like a mirror or the French candle holders for a hall that has a French style with some small pieces on the side buffet desk. For oriental dining hall theme, have oriental rugs, wall lanterns, wall sconce or copper dishes, a mirror-framed by shells or mosaic, rose water sprinkles on the table or an agbani or domascino cloth hanging around the mirror. Use small candle holders or small lanterns with small wall plaques that fit with the illumination and the stair’s banisters. ALGEDRA Trading & Furniture is specialized in providing home and office furniture, our products include Turkish and Italian furniture for elegant residential and hospitality projects in the regions. Our products comprise of residential furniture, office furniture, fabric, doors, ceramic tiles (Italian, Spanish & Turkish), lighting, and carpets. We are providing services in GCC, Africa, United States, and Europe. Our main projects include residential (palaces, villas, penthouses, apartments, residential towers), hospitality (hotels, hotel apartments, boutique hotels), restaurants, spas, and commercial wellness centers such as business towers, retail shops and showrooms, coffee shops, and banks. Copyright © 2018. ALGEDRA Trading & Furniture . All rights reserved.